The Daily Telegraph is reporting that the Conservative Party set up a property speculators forum that “raises around £150,000 a year for the Tory party and charges members £2,500 to meet senior MPs to discuss policy and planning issues.” It is chaired by Mr. Mike Slade, of Helical Bar Plc. That firm is one of Hammersmith and Fulham Council’s preferred partners behind the highly controversial new Town Hall office plans. The Telegraph tells how Mr Slade has been a key influence on the Conservative Party's developing planning policies and how he has also generously “given more than £300,000 over the past decade, individually and through his property firm, Helical Bar.” You can read the full article by clicking here. Helical Bar Plc and their partners Grainger Plc came together to form King Street Developments after the Conservative Administration picked them as their preferred property speculators for their Town Hall plans, after winning the local elections in 2006. 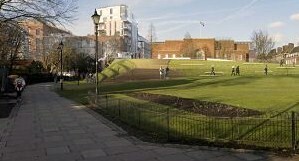 Meanwhile, the latest Town Hall plans were announced over the summer and still include proposals to demolish the cinema, demolish homes for the blind and blight Hammersmith with Basingstoke style skyscrapers. The local residents' group, Save Our Skyline (SOS) have arranged another public meeting to review this awful scheme. That will take place at 7.00pm on Tuesday 27th September at Rivercourt Methodist Church, King Street, Hammersmith. I'm sure there will be a lot to discuss.